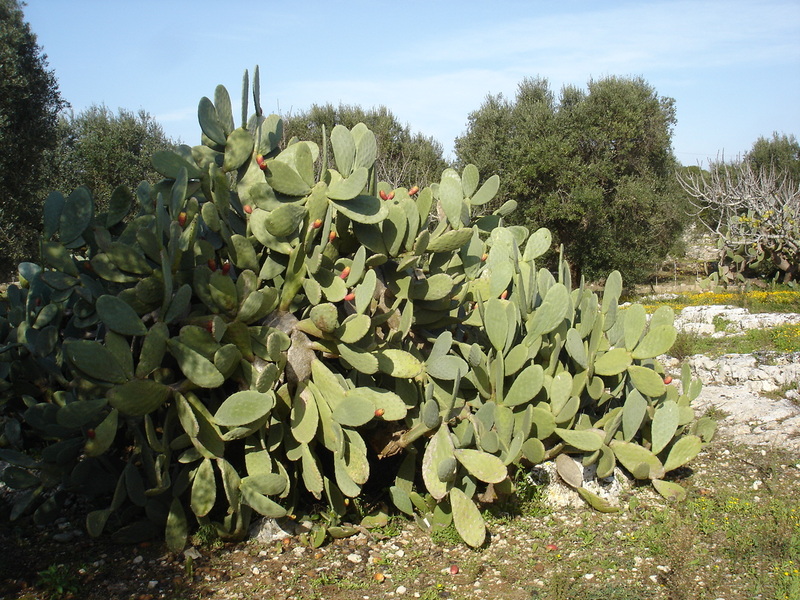 Over the past two years the olive plantations in the province of Lecce and other parts of Apulia have been attacked by a proteobacterium never previously seen in Europe known as Xylella fastidiosa. Up to a million trees are thought to be affected, with withering of the growth shoots rapidly leading to tree collapse. The entire Mediterranean basis risks being affected in a manner analogous to the effects of the Great French Wine Blight of the nineteenth century. I won’t be picking olives this year in Presicce: there are no olives to pick, and some of the ancient trees mentioned in the article have been destroyed as a precautionary measure. 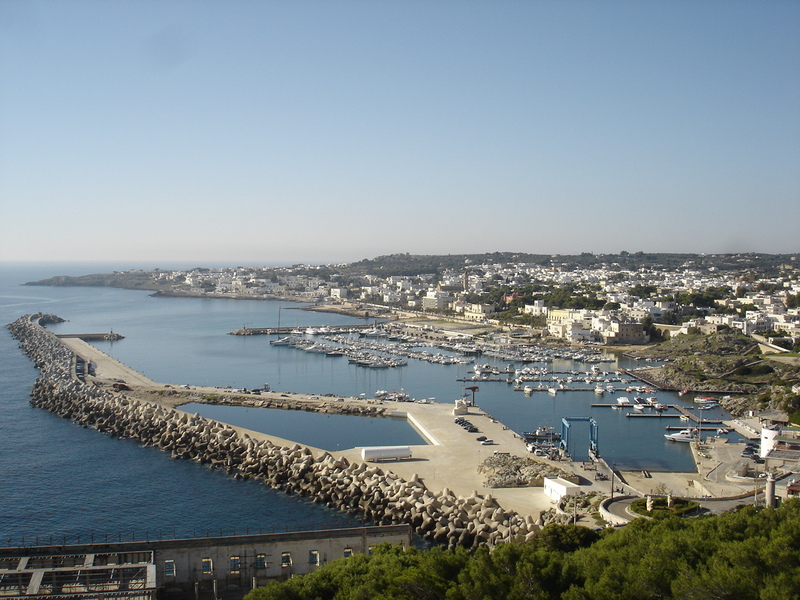 In the second week of November my wife and I make our way down from the Upper Rhine to the heel of Italy, even though late autumn isn’t the best time to travel from central Europe to the basso Salento—the stiletto of the large southernmost province known as Apulia or Puglia. Air Berlin offers a once-weekly flight to Brindisi from Munich, and if you forget to book it there’s the long-distance bus across the Alps to Lecce, which takes an entire day. For four years in a row we’ve managed to fly south in November, and even though last year I had to make an emergency visit to my mother in Scotland, my wife kept the tradition going on her own. Our reason for visiting Apulia out of season, aside from the fact that November still offers pleasant days and a temperature around 20° C, is straightforward enough. This is our annual working holiday: we go to help with the Mediterranean’s major winter harvest—olives. Our host is Anna, formidable Italian mother-in-law of my German brother-in-law. (That makes my bond with her somewhat tenuous but Anna treats me just like family.) She migrated to Germany from the mezzogiorno in the 1950s, when jobs were scarce in her native region of Campania, married a taciturn Rhinelander called Hermann, and had five children with him in a little town in the Allgäu, where they have spent all their married life. 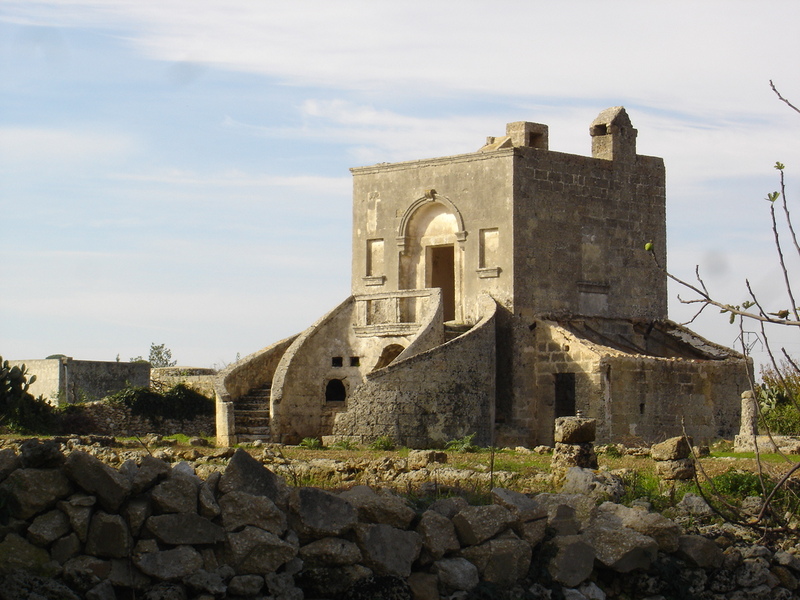 And twenty years ago, with their scanty savings, they bought a ruined masseria, one of those ancient fortified homesteads studded across the region, between Presicce and Santa Maria di Leuca, Italy’s finis terrae, and did it up over a decade. Anna is the kind of person John Berger wrote about in his trilogy Into Their Labours—a refugee from one of Europe’s dying villages. The salt of the earth, and someone who knows a lot about its savour too. I’ve learned many kitchen skills from her, not least how to make pasta from fine durum flour, and methods of preserving garden vegetables, from zucchini to pepperoni. She showed me once how to cook perfect cotolette di melanzane—long slivers of eggplant dipped in a mix of flour, parmesan and parsley and beaten egg before being fried—while we drank our way though a bottle of the local primitivo, a strong, peppery wine that somebody once described as “a marriage of blackberries and tar.” Her five children were brought up on a shoestring budget; she sewed clothes for them and made money on the side with hand-painted porcelain dolls which she used to sell on the local market in their town in the Allgäu. She has never entirely mastered German—and it can be a strain to sit with her sometimes, hanging on her every word in order to tune into her Italian way with those unmanageable northern consonantal clusters (she pronounces “tiptop” “tip-peti-top” and I only surmised from the context that the knobbly word “ge-kno-be-lo” was her domestication of the German word “Knoblauch” (garlic)). It didn’t stop her minding all her children through school and into good jobs. And though she likes to read detective novels in the evenings in the only room of the masseria heated by a log fire, very little of Anna’s vast fund of practical knowledge comes from books. Given her lifelong socialist if not communist sympathies, it’s perhaps surprising that she’s even a modest castellana. In earlier times, the ground floor of a masseria would be tenanted by farmers and servants, and the upper level opened up in the summer for the visiting families from the big towns. Its Spartan fittings are accentuated by its imposing size. The thick stone walls render a November night distinctly chilly, although the garden still offers figs and pomegranates, and the ridge of Indian fig cacti separating it from the small olive plantation of 220 trees flash their bulbous clown’s-nose fruits or fichidinia. Anna is able to turn these into a sorbet and impresses me even more by discovering edible plants everywhere she goes: rucola, fennel, wild asparagus spears. This unmanicured region is a part of the country visited by Italians themselves, if not at this time of year: Eugenio Montale’s famous poem “Eastbourne”—which opens with the brass-band playing “God Save the King” on the stand at the shoreline—may not be so much about the British at the beach as an Italian remembering the abyss off his own coast. “La festa non ha pietà”, runs a line of the poem—holidays are pitiless. It is a grim enough thought for bank holiday England, but it might better describe a November among some of the older olive groves in Apulia. Olive trees are indifferent to such bleakness, especially the bleakness of short-lived human moods: I took scores of photographs of mature individual trees that had taken on the most startling anthropomorphic shapes behind the tufa boundary walls. 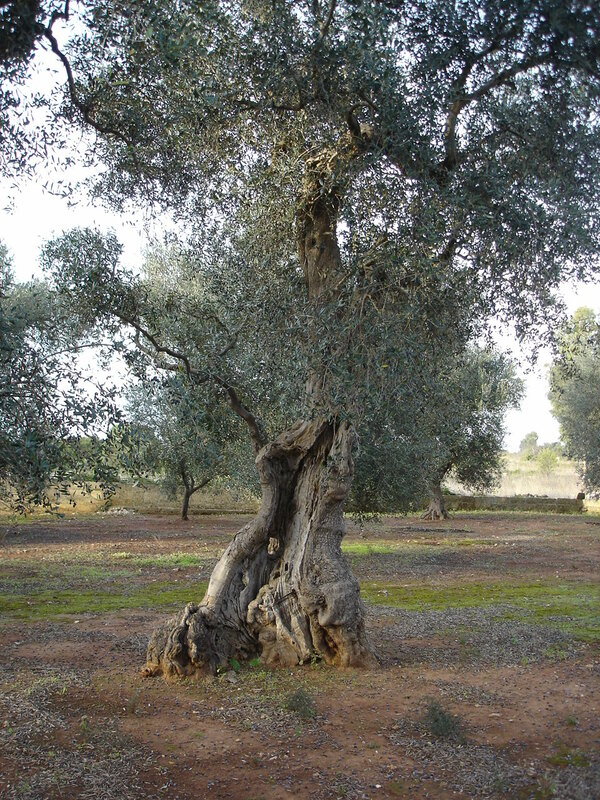 Olive trees can live for many hundreds of years, and even survive burning and other acts of wanton destruction. The French illustrator Gustave Doré was fascinated by their contortions too, and used them as models for the images of hell in his famous illustrations to The Divine Comedy. His instinct was a good one: the founders of all three monotheisms were awed by the olive tree and its singular produce. “Christos”, after all, means the “anointed one”—anointed, that is, with chrism. Christ is olive oil, you could say, with a hint of balsam. If you stand on the flat roof of Anna’s masseria, you can just glimpse the hard glitter of the Ionian Sea at the edge of the flat landscape. Not far away on the other side is the rockier Adriatic coast leading up to Otranto, the ancient promontorium Iapygium which figures in Greek as much as Italian history. The masseria itself sits four-square in a green wash of olive canopies, in all directions. Only a few Aleppo or parasol pines stand out among their serried ranks, along with the conical trulli—Apulia’s version of the bothy. The air is still except for the odd stray dog, distant reverberation of a car or the radio playing on a tractor, and at weekends the occasional crump of a rifle as a hunter tries to catch a bird on the wing. The plastic cartridges of the hunters litter the paths; and it can feel distinctly unsafe to go for a constitutional when they’re out in number on a Saturday or Sunday. But every hand is needed for picking, and entire families congregate in some of the groves; time is of the essence, since the olives have to be harvested at the turning point known as invaiatura and taken to the mill for cold pressing before they start to ferment. Olives aren’t so much picked (which would be a truly Sisyphean task) as combed or shaken out of the trees. Broad diaphanous nets are spread out on the ground, and the branches given a good carding and heckling; they can be pruned too as the olives fall. Many farmers use machines, which do a brutally efficient job of shaking out the olives along with a good deal of leaves and extraneous debris. Doing it by hand is hard work, but there is a genuine sense of accomplishment when the mass of greenish-purple olives is carted away to be weighed prior to pressing. All of this has to be done within a matter of hours, in order to avoid oxidation; the oil is milled out by a simple hydraulic or centrifugal device in a process that is more like squeezing juice from fruit than extracting vegetable oils from seeds or drupes. Hermann and Anna have never treated their olives, and their oil is premium-quality organic. A tonne of fruit will produce about 200 litres. Industrial production methods and adulteration aren’t necessarily a problem for people trying to sell the genuine extra vergine oil, who often have their own sales networks and contacts and remained unaffected by dumping prices at the supermarkets. At the local cooperative mill in Presicce, you can stand and watch the entire pressing process: the mechanical cold crushing and malaxing in drums that allow the oil droplets to agglomerate and separate from the wet pulp. (The residue or pomace is taken to other mills to be heated and chemically treated with solvents in order to win inferior-grade oil for industrial applications.) In a few days, the entire harvest will have been processed. Oil has to meet exacting organoleptic criteria if it is to be labelled as extra vergine, a classification that permits only a very low degree of acidity—acidity being an index of corruption. In fact, freshly pressed extra-virgin oil isn’t smooth and gentle, but robust and peppery. It has a phenolic “green bite” (due to the chemical oleocanthal) that can make you cough, although you would hardly know it from the way it is marketed. That is the second adulteration—of taste. Last year was a good year for Anna and Hermann: they had a yield of about 700 litres. This year is uncertain. Unpredictable and irregular harvests have to be accepted if you farm organically: sometimes there are no olives at all if conditions aren’t right in the spring. And then there’s the continual logistical challenge of shifting the oil by road in the back of the family van, a couple of hundred litres at a time, over a thousand kilometres to the north. It seems to me that we, as guest pickers, reap the major benefit of all this communal effort; we return home with a couple of ten-litre alembics as a reward for our contribution to the harvest. That keeps us in olive oil for the year. There is also the satisfaction of knowing that our own efforts have helped to produce what we consume. It’s a simple but subtle pleasure, and one not without appeal in an age in which production and consumption are almost entirely uncoupled. Ivan Illich would have recognised (and commended) olive-picking as a “convivial” activity, and therefore meaningful in itself. Besides, we all need to be a bit cannier these days. Mueller suggests in his book that most of the cheap olive oil bought in supermarkets today would have been regarded by the Romans as fit merely to be left flickering in their lamps.